Artist impression of the GOES-R satellite. Image courtesy of NASA. On Saturday, 19th November, at 10.42pm GMT the Geostationary Operational Environmental Satellite-R Series (GOES-R) is due to be launched from Cape Canaveral in Florida, USA. The GOES-R is a geostationary weather satellite operated by the National Oceanic & Atmospheric Administration (NOAA) Department of the US Government. 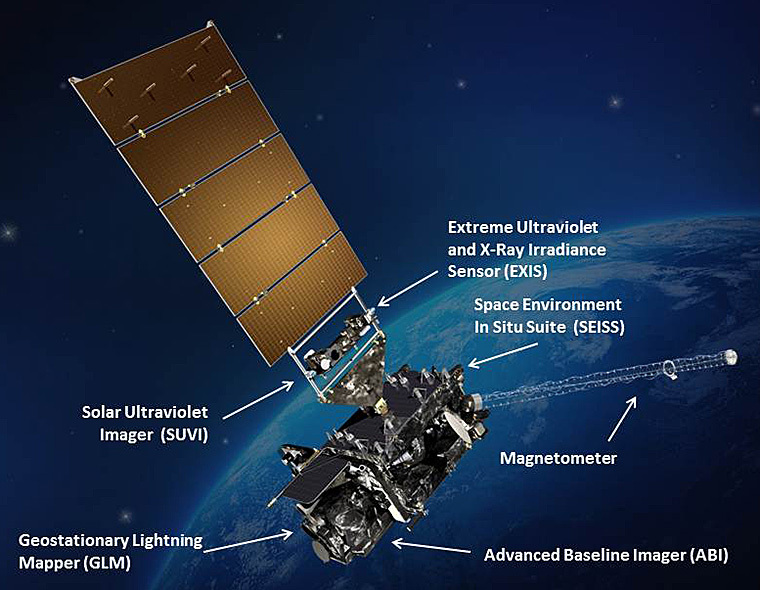 It will the latest in the NOAA’s GOES series of satellites, and will take the moniker GOES-16 once it is in orbit, joining the operational GOES satellite constellation comprising of GOES-13, GOES-14 & GOES-15. It will be put into a geostationary orbit at around 35 800 km above the Earth which will allow it to match the Earth’s rotation, meaning that it will effectively stay over a specific point on the Earth. It will be located approximately at 137 degrees West longitude, and through the constellation will provide coverage for North, Central and South America together with the majority of the Atlantic and Pacific Oceans. Artists impression GOES-R satellite and its instruments. Image courtesy of NASA. The instrument suite aboard the satellite has three types: Earth facing instruments, sun facing instruments and space environment instruments. Earth Facing Instruments: these are the ones we’re most excited about! Advanced Baseline Imager (ABI) is the main instrument and is a passive imaging radiometer with 16 different spectral bands: two visible bands – Blue and Red with a spatial resolution of 0.5km, four near-infrared with spatial resolutions of 1 km; and ten infrared bands with a spatial resolution of 2 km. As its in a geostationary orbit its temporal resolution is extremely high with the full mode being where the Western Hemisphere is imaged every 5 – 15 minutes, whereas in its Mesocale mode (providing a 1000 km x 1000 km swath) the temporal resolution is only 30 seconds. Geostationary Lightning Mapper (GLM) is, as the name suggests, an instrument that will measure total lightning, and both in-cloud and cloud-to-ground lightning across the Americas. It is an optical imager with a single spectral band of 777.4 nm which can detect the momentary changes in the optical scene caused by lightning. The instrument has a spatial resolution of approximately 10 km. 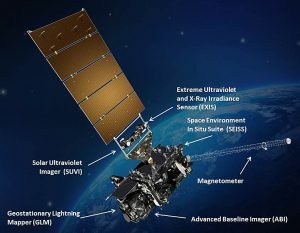 Extreme Ultraviolet and X-ray Irradiance Sensors (EXIS) instrument has two sensors to monitor solar irradiance in the upper atmosphere; these are the Extreme Ultraviolet Sensor (EUVS) and the X-Ray Sensor (XRS). Solar Ultraviolet Imager is a telescope monitoring the sun in the extreme ultraviolet wavelength range. Energetic Heavy Ion Sensor (EHIS) to measure the proton, electron, and alpha particle fluxes at geostationary orbit. Magnetospheric Particle Sensor (MPS) is a magnetometer measuring the magnitude and direction of the Earth’s ambient magnetic field; and has two sensors the MPS-LO and MPS-HI. Solar and Galactic Proton Sensor (SGPS) will, as the name indicates, measure the solar and galactic protons found in the Earth’s magnetosphere. Magnetometer will measure of the space environment magnetic field that controls charged particle dynamics in the outer region of the magnetosphere. The ABI instrument is the most interesting to us in terms of Earth observation, and it will produce a remarkable 25 individual products including Aerosol Detection, Cloud and Moisture Imagery, Cloud Optical Depth, Cloud Particle Size Distribution, Cloud Top Measurements, Derived Motion Winds & Stability Indices, Downward Shortwave Radiation at the Surface, Fire/Hot Spotting, Hurricane Intensity Estimation, Land Surface Temperature, Moisture & Vertical Temperature Profiles, Rainfall Rate, Reflected Shortwave Radiation at the Top Of Atmosphere, Sea Surface Temperature, Snow Cover, Total Precipitable Water and Volcanic Ash. If you want to look at the details of specific products then there are Algorithm Theoretical Basis Documents (ABTDs) available, which are like a detailed scientific paper, and can be found here. The GOES-R is the first in a series of four satellites to provide NOAA with improved detection and observation of environmental events. It is not a cheap series of satellite, with the cost of developing, launching and operating this series estimated to be around $11 billion. However, this will provide observations up to 2036. We’re excited by this launch, and are looking forward to being able to utilise some of this new generation weather information. This entry was posted in Data, Earth Observation, NASA, Oceans, Remote Sensing, Space Industry, Understanding Space and tagged Advanced Baseline Imager, Aerosol, Cloud, Earth Observation, environment, Geostationary Lightning Mapper, Geostationary Operational Environmental Satellite, GOES, GOES-R, Land Surface Temperature, NOAA, Rainfall, remote sensing, sea-surface temperature, Temperature, Volcanic Ash, weather by Andy. Bookmark the permalink.